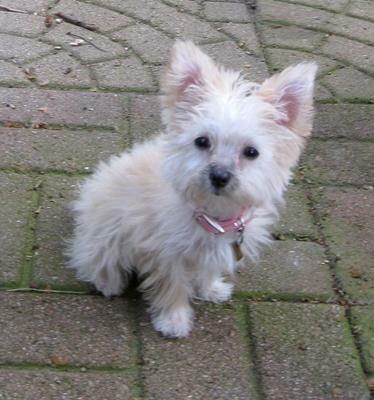 At 16 weeks, my puppy Bitsy weighed 30.2 ounces or 1.9 lbs. She should be around 3-3.5 lbs fully grown. She's lightened up a LOT in the past two months since I got her. I'll upload a picture of her when she was 8 weeks and another that's recent - she's about 4.5 months here (taken last week, May 22, 2011). Thank you! We think she's pretty cute, too. 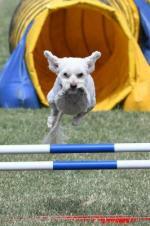 Bitsy is a Morkie : Mom was a 4 lb Maltese & dad a 3 lb Yorkie. Bitsy is adorable! What is her breed mix? My sweet lil Bella is 13 weeks and weighs 1.4 lbs. her weight is below the amount for 13week. 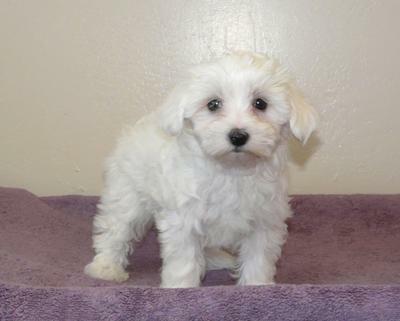 I assume she will be a tiny Maltese. Brianna will arrive home from a breeder in Missouri this Friday, she is 10 weeks old and wiehgts 2.8 and her height is 8.5 lenght 11.5, I think I was taken for a fool, wanted a small dog but according to this puppy weight chart our dog will grow to be enormous like 12 lbs. Maybe I did it wrong and I hope so, otherwise I will be getting something I did not pay for. 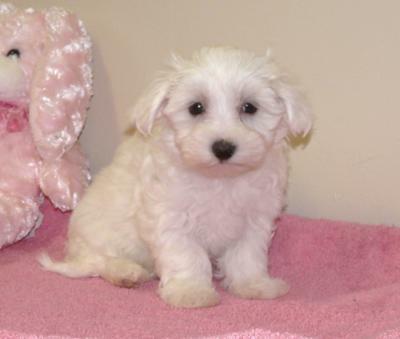 Can someone answer me please I want to know so I can prepare my little girl since she had her heart set on a Maltese. My sister has one and he is like 6lbs. and he is 2 years old. Brianna at 10 weeks 40 ounces, at 20 weeks 80 ozs and I still don't get the final result from this puppy weight chart. My baby made it home today safely. I can not tell you how happy the whole family is , we are just totally in love with our little girl Brianna, you were all right in saying that once you have this wonderful little creatures, it's addictive , my husband want's another one!!!!!! 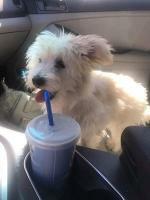 My Maltese Sammy is 16 weeks and was just at the vet for his shots. The vet figures him to be about 7 pounds when full grown. 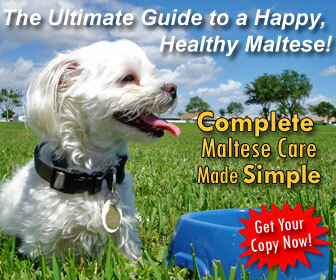 Most Maltese reach their full growth at 6 months. 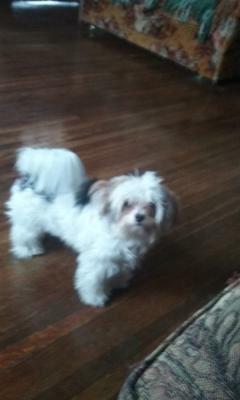 Sammy seems big to me compared to his older sister, 2 year old Morkie who weighs 7 pounds. Part of the reason Sammy seems big is all the hair he has. When I stick them both in the bath it looks like I have two tiny Chi's. A dog that's a little bigger is less apt to get hurt as they love to play and do what we Maltese owners refer to as "zoomies" where he runs through the whole house at full speed. Belle, my Morkie also still does them. Be careful when she starts to jump on furniture, they think they are cats! Sammy can almost make it but not quite yet. He has no concept of falling off the edge. Good luck with your baby, I know you will fall totally in love with her. 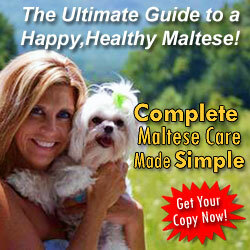 There are many good Maltese forums on the net that can answer any and all questions you may have. 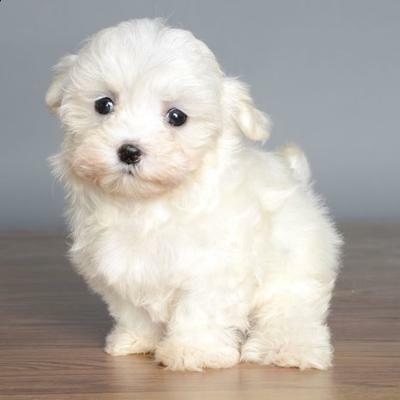 We are all kind of like a family with Maltese as our babies. Good luck with your cute little furrball! I know she will wrap herself around your heart in seconds! These little Maltese and the mixes from them have to be the most fun little dogs ever. Whatever you do, become her pack leader before you smother her with affection. These little guys take over quicker than any big dog ever did, believe me. They need excercise, discipline, and then affection always in that order. If you aren't the boss right away, they will be! I really have to say Thank you all the info you guys have given me , have been great , it certainly has put my mind ease finding the support I needed best page ever, my babys comes home tommorow wish me luck, I'm so excited!!!! I'm sorry. I read the age wrong. 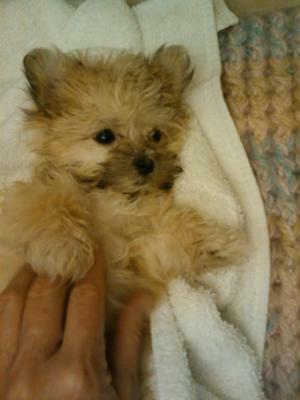 But even at 10 wks.--Muffit was 2 lbs. 14 ozs. at 11 wks. So that is right in the ball park for Brianna. Muffit was 5 lbs. at 6 mos. And as I said Muffit is only 7-7 1/2 lbs. now at 1 yr. 4 mos. She hasn't gained or grown since about a year old. And she is a tiny dog, not much bigger than my two Chihuahuas I had before her were. Not 10 months old , that is why I'm so worried that she will grow really big. 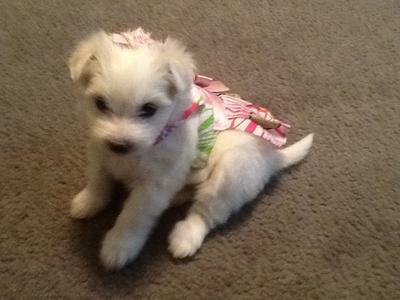 I think you will love your new puppy no matter how much she ends up weighing. If Brianna weighs more that you expected then you will have more of your wonderful girl to love. My Finnigan was supposed to be no more than 61bs, both his parents are very small but at 11 months old he weighs 12.6 1bs (I believe I may own a maltichon mutant!!) and I love every ounce of him. Hope you enjoy your beautiful girl please keep us informed on how she is doing. 6 1/2 lbs. at one year. She is about a 1 yr. and 4 mos. now. She measures 14" long and maybe 8 1/2" to her shoulder height. I consider her a very small dog. Teacup sized dogs and Chihuahuas are the only ones smaller. She is a little bigger than some Yorkies. I don't think growth charts are all that accurate. Hi my little guy Spencer is 12 lbs. very happy healthy and little. He is very much into his body. You can still feel his ribs. Just love him a few little pounds come and go. Bowen is not staying on course with the puppy growth chart. I hope he levels off! Mystee is a new family member, she is nine weeks and weighs 3lbs 2 oz. she is very lovable great baby very playful we enjoy having her. 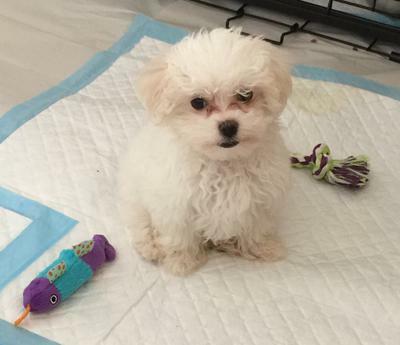 My Maltese puppy is 12 weeks old. She is 5.3 pounds. Too fat according to the puppy weight chart!!! Don`t you think? 22 ounces at 10 weeks. Rasta is 14 months old.she weighs 4.5 lbs.she is smaller than the rest in the litter. She is very cute - what breed is she? I see colors other than white so I'm curious - especially since she's so small. Katie was 4 months old when I got her and she was under 3 lbs. She is now 7 yrs old and weighs 17 lbs. She is a diva but "will work for food" preferably MINE....lol. 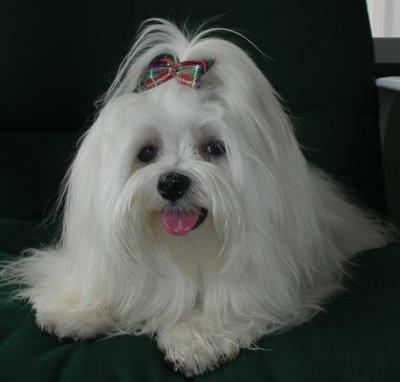 I have a 4 year old Maltese named Faith. She has brought so much comfort and joy into my life. She is a pleasure to take on long walks to lakes and through the woods nearby. When I do my college homework she lays nearby and when I sleep she snuggles right up to me. It is amazing! I keep her looking like a fluffy teddy bear with hair trims and clean eyes. She doesn't mind dog toothpaste and long showers. She recently learned how to jump in the car and into her booster seat and waits for me to put the safety belt on. She is fastened with a special harness that attaches to her seat so she can hang her head out the window safely. When visiting malls, she comes along in her stroller. These dogs are beyond special and I am so grateful to God I can own one. Thanks everyone. She is definitely a diva!